We survived yet another winter!! Now that spring is here, birds are a-chirping and it's the perfect time for some spring lamb cutlets. I took a look at my rosemary shrub and was overjoyed to see them in the most beautiful shades of green. Really, nothing beats freshly-cut herbs from your own garden, so I've decided to make a mediterranean-inspired lamb cutlets with a few springs of rosemary that I cut from the garden. 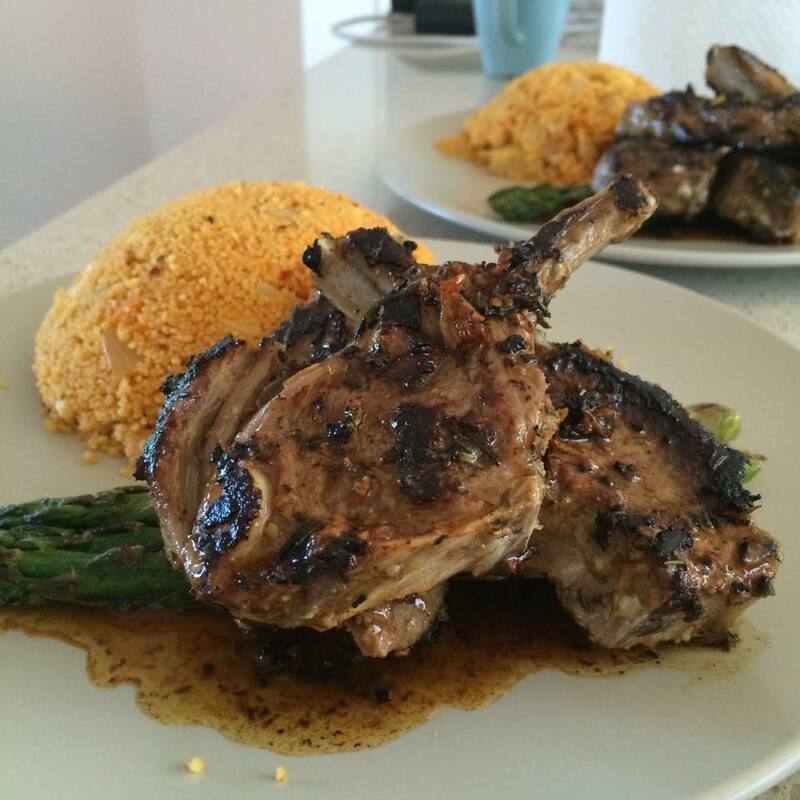 I love the taste of charred garlic so I used a bulb of garlic for eight lamb cutlets. But if you're not a fan, you can use minimal amount. 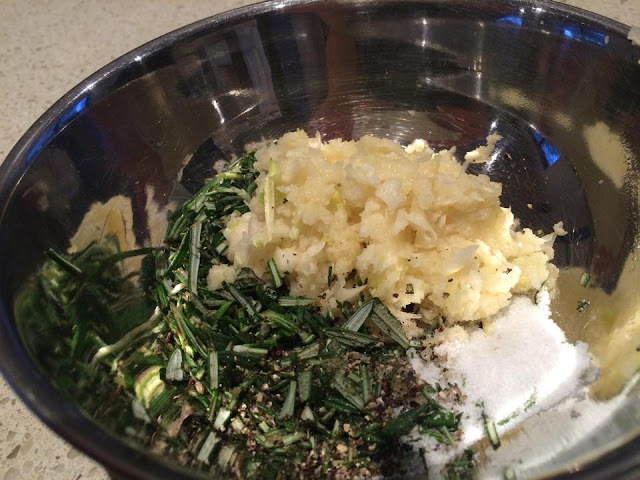 Pluck the rosemary leaves off the stems, then cut it into small pieces (or blend it until it's fine and paste-like). Mince the garlic, and add some salt and pepper. I call olive oil "liquid gold," just look at the colour! Stir the mixture until it resembles a paste. Then, squeeze half a lemon's juice and stir until combined. 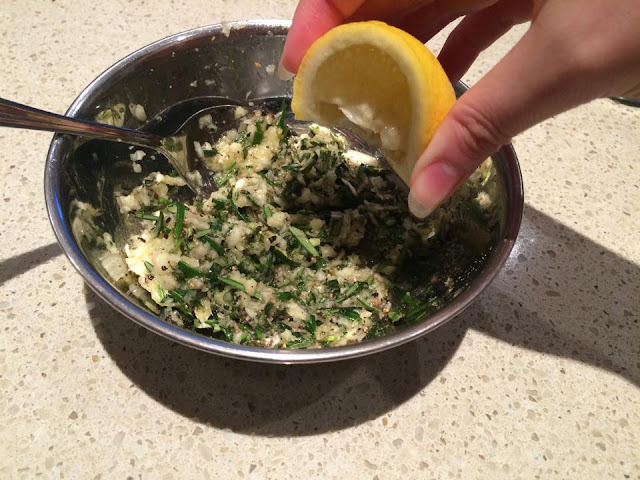 For the final step of prep, just mix through the marinade mixture, making sure to cover every surface of the lamb. Then, cover and refrigerate until 30 minutes before cooking time. Leaving your meat covered in room temperature before cooking ensures that your meat will cook properly, rather than having a burnt outside, but undercooked in the middle. Although some people prefer their meat well-done, I reckon lamb is at its best medium-rare, where it is succulent, juicy and tender. To achieve that, I heat a shallow frying pan on high heat until it's sizzling (sprinkle a few drops of water on the pan, it's ready when the water droplets sizzle and evaporate), then put the lamb cutlets on the pan. Leave the cutlets to sizzle and cook for 3.5 - 4 minutes, then turn and cook the other side for another 3.5 - 4 minutes. If you didn't trim the layer of skin and fat off the lamb cutlets, you can also sizzle the fatty bits until it's golden brown. Once the lamb cutlets are done, leave it on a plate, cover with aluminium foil and let it rest for 10 minutes. Resting your meat will allow the meat juices to redistribute back into the meat, thus making your freshly-cooked meat more juicy. Cook/ plate up your sides, then sit back and enjoy! 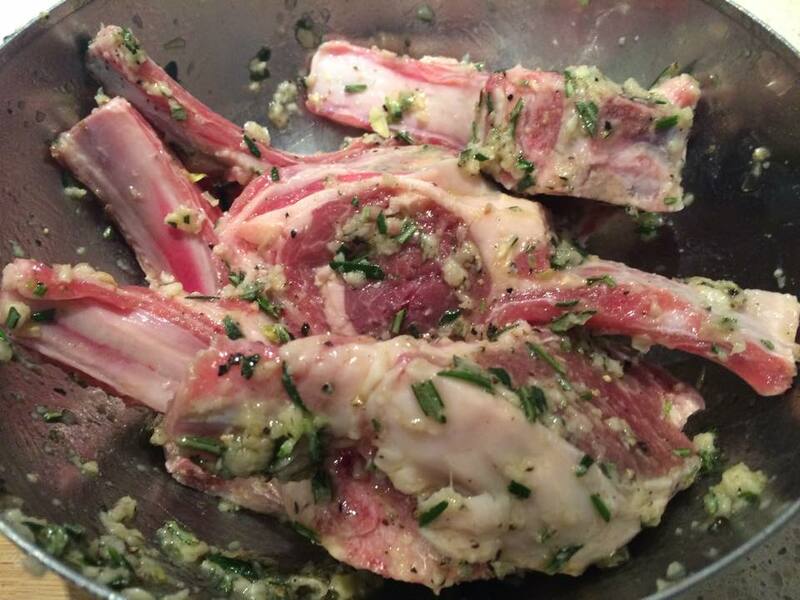 Wash and pat dry the lamb cutlets in a big mixing bowl. Trim the fat off the lamb and french it, if preferred. Leave aside. 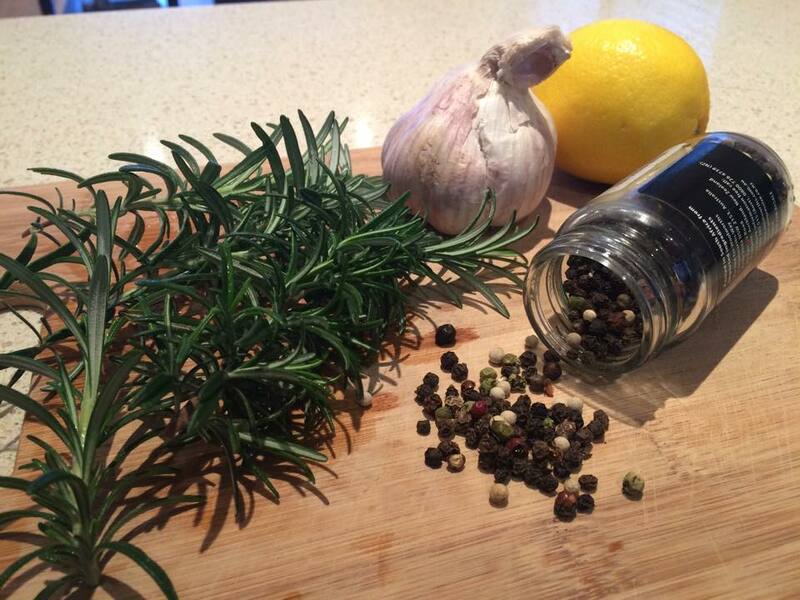 Cut or blitz the rosemary leaves and garlic (skin off) into tiny pieces resembling a paste. Combined in a small bowl with salt and pepper. 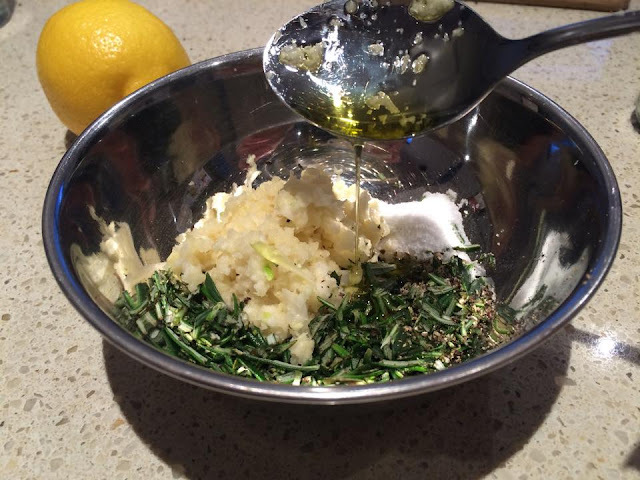 Add the olive oil and lemon juice in the mixture, then stir through until combined until it's a paste. Pour the mixture in the mixing bowl with the lamb. With a pair of tongs or your hands, mix through the marinade with the lamb cutlets until every surface of the cutlets are covered with the mixture. Then cover the bowl and refrigerate. 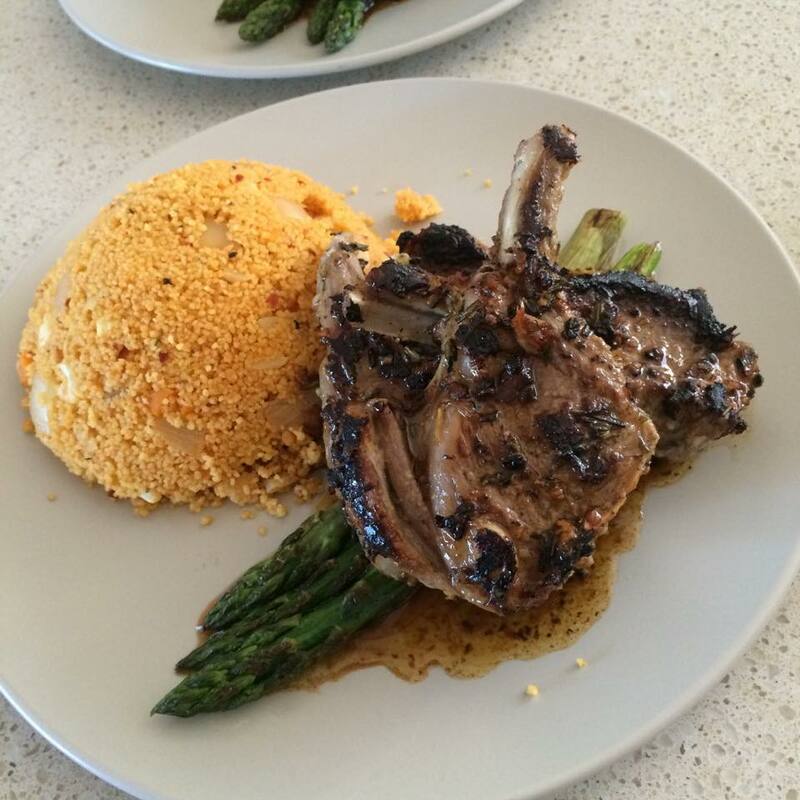 Take the lamb cutlets out of the fridge 30 minutes before cooking time and let it sit on room temperature. Heat a shallow frying pan on high heat. Brush the pan with olive oil (optional). When the pan is heated, gently put the lamb cutlets on the pan without over-crowding. Let the cutlets sear for 3.5-4 minutes. Then, turn the cutlets and let it sear for another 3.5-4 minutes for medium rare. Remove the lamb cutlets from the pan and put it on a plate. Cover the plate with aluminium foil to rest the cutlets for 10 minutes.